Quick Connection Device connects 2 distinct air/fluid lines. Coupling has non-spill valve design. 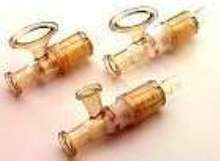 Quick Coupling suits high-purity fluid handling processes. 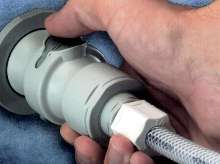 Non-Spill Coupling meets smaller size requirements. 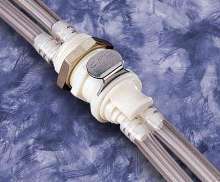 Couplings increase safety of tubing connections. 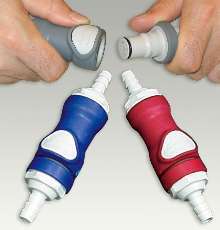 Couplings can be disconnected without spillage. Quick-Disconnect Couplings suit high-flow chemical handling. 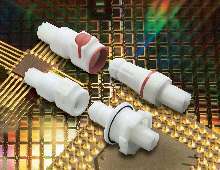 Couplings simplify cooling of electronic enclosures. Rack and Panel quick-disconnect, non-spill couplings make close-loop liquid cooling safe for electronic enclosures. 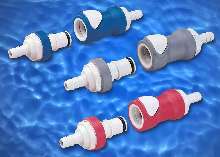 Made of aluminum and thermoplastics, they are virtually leak-free with flow rates reaching 14 gpm at 100 psi. 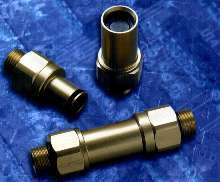 Couplings are suitable for cell tower base stations, power amplifiers, computer cooling, circuit board testing, and MRI cooling.